This is another "looking out my window" layout!! I try to have my camera ready with the correct lens on it so I can shoot from my window in my "scrappy" room. This little guy lives in that hole in the tree. I watch him almost everyday collect his nuts and hiding them. He is very clever. I used G.C.D. Studio/Melody Ross﻿ pattern paper on this with Bazzill cardstock. 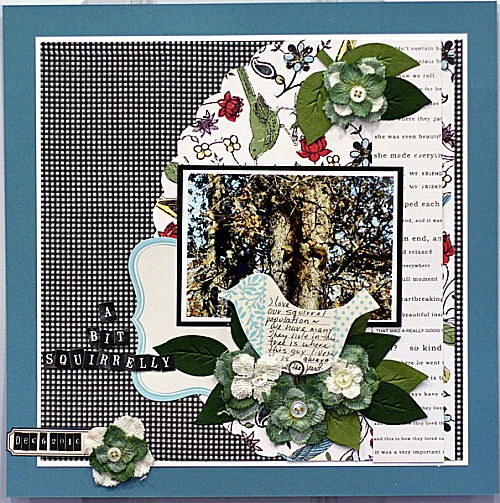 I don't think I can scrapbook unless I use some Jenni Bowlin and Prima~love them both!!! !The title is done with Cosmo Cricket. 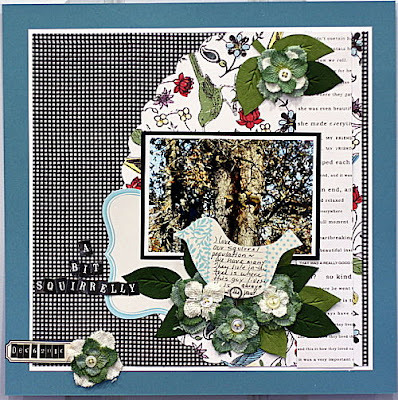 And I must mention the leaves by Bazzill Basics love using these~ they add so much dimension to your project. I have a my class at CraftCrossing this weekend and Sunday the NBA Allstar game~looking forward to both!!! Have a great weekend !! oh this is just beautiful. i love the papers and you so rocked it. Beautiful layout. I'm with you Prima and Jenni Bowlin are amoungst my favorites. Love your title for this!! It is a beautiful layout and I love the idea of just a random kinda shot of what you see out your window. Very nice!! just gorgeous. love this idea, too! Oh, I LOVE the "looking out my window" - idea!!! If i didn't have our storage shed right outside my window, I would probably ask you for permission to lift it ;-) Beautiful layout!